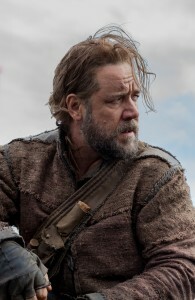 The big budget movie, Noah, opens this weekend. And if you’re active at all on social media, you know that it’s already stirred a significant level of controversy. Some Christian leaders have called on their congregations and followers to boycott it because of the creative license that writers have taken with the story. Other commentators see little difference in this movie and other film versions of Bible stories that fill in to make a more detailed and interesting story. My purpose is not to promote or criticize the content, but rather to urge Christians to use the movie and the controversy as an opportunity to engage with people who are outside the faith. Instead wasting time hashing out obvious points of contention or debating about Russell Crow, Director Darren Aronofsky or details about the movie itself, I urge you to take the opportunity to steer conversations to the real story of Noah. Though it’s one of the most familiar and best loved stories of the Old Testament, most people -even many believers- have little understanding of the relevance of this account to God’s overall story of redemption. In Genesis 6, Scripture pictures the world of that time as wicked, full of corruption, violent, and that the hearts’ of the people were intent on evil all the time. (vs 5-6) Yet, in a culture where no one else chose to follow the Lord, Noah committed himself to a life of righteousness and faithfulness to God. Chapter 6 verse 9 contains the definitive commentary on his life. 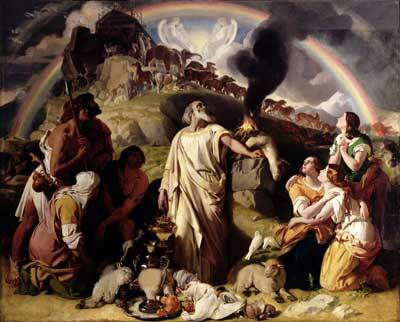 “Noah was a righteous man, blameless among the people of his time, and he walked with God.” In response to his faith, God commissioned Noah to build an ark that would provide a way for him, his family, and a sampling of the animals of the world to be saved from the destruction. All he had to do was follow God’s instructions, commit himself to the task and at the proper time, choose to enter the ark and be transported to safety. Today, people live much like they did in Noah’s day. They are obsessed with the sinful pleasures this world offers, ignoring the fact that, just as in Noah’s day, judgment is coming. God is still holy and does not tolerate sin any more today than He did in ancient times. So once again, He has set a day and time for cleansing of the earth of impurity (this time by fire – 2 Peter 3:10) And like long ago, God has provided a way for everyone to be saved from the coming judgment. But this time, the way to safety is not a wooden boat; Our ark is a person – Jesus Christ! All we have to do is choose to receive the salvation He has provided by trusting in Him through faith. (Romans 10:9-10) Since we never know when time is up, (Matt. 24:42) it’s imperative that we enter the “ark” and diligently encourage to others to join us before God closes the door! It is my understanding that this movie confuses the message of the Gospel by bringing in the heretical Gnostic beliefs that God is beneath Satan in the end… For me it is a waste of precious time and resources God’s given us on this planet (to spend $14 and an 90 minutes on that movie). I’m not advocating going to the movie or endorsing the message of the movie, but we should realize that lots of people will go to the movie and are currently talking about it. If Christians pay attention, we can guide discussions away from the Hollywood version and back to the true story of Noah and God’s plan of redemption. I agree we should you the opportunity to promote the Gospel message. Thank you for sharing this. God bless you! Thanks for the link! I haven’t seen the movie yet, so can’t comment on specifics, but I think the details might actually be a distraction to the opportunity this movie affords. Instead of focusing on what’s wrong or right with it, we need to major on pointing people to the real story of redemption that finds its fullness in Christ Jesus. Truth is, God doesn’t need Hollywood to tell His story. Because redemption lives IN us, that’s our job. Thanks for the comment! Amen! The article suggests using the movie as leverage to turn the conversation, much like you said. It just had info about the movie I thought might be of help. I read it, and appreciate the link! Thanks! I do think Christians need to be informed and know what we are talking about in order to speak knowledgeable, and since you never know what will be in movies these days, pluggedin.com is a fantastic resource for being aware of content before walking into movies blindly. We hardly ever go to the actual theater for movies because it’s so expensive, but think we will this time. If we sought to find ways in the world to discover just a little truth–fulfilling God’s promises through current examples, how much easier it would be to share our FAITH. As we read the examples given to us in The Hall of Fame of Faith (Hebrews 11), the writer ends the chapter in saying, “And all of these, though they won divine approval by [means of] their faith, did not receive the fulfillment of what was promised” (verse 39). Why was that? “Because God had us in mind and had something better and greater in view for us…” (verse 40). I’m am going to see the MOVIE Noah, for the reasons you stated. To stir up conversation; to use the God given opportunity to SHARE the Promise! Yes, I think that if God was offended by their behavior then he should be equally upset with us now if not more so. All the Old Testament was given to teach us truth. Noah should tell us alot about the times we live in now. Thanks for reading and commenting! I agree with you Jeff. We know that judgment is coming soon just looking at our society that is bent away from God just like in Genesis 6. Most people in our society don’t think about judgment, they are caught up in this wicked, corrupt world. Thanks be to God for giving us Jesus! Thanks for reading, Ladies! Love your encouragement! What a great parallel between then and now. Well done.